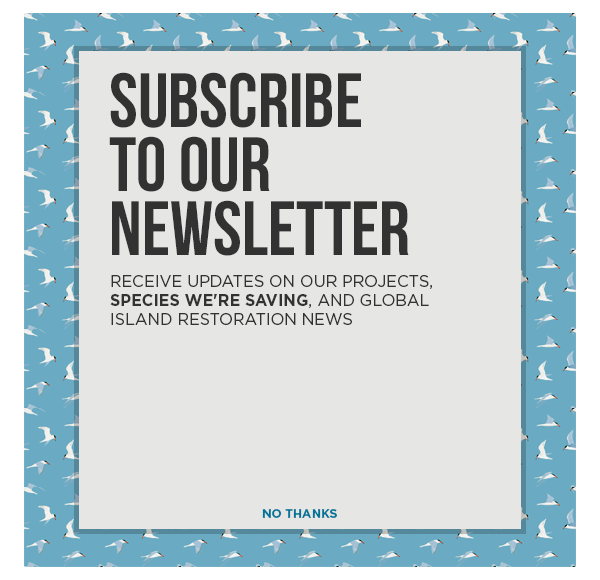 Island Conservation’s co-founder Bernie Tershy reflects on how island restoration programs serve to protect biodiversity and prevent extinctions. An uninterrupted stream of bad news about the environment reminds us that we are in the midst of an extinction crisis, which can leave us overwhelmed with hopelessness. But, hope is not as scarce as you might think. We can start to find solutions to the extinction crisis by simplifying the problem. For starters, almost 90% of known extinctions are concentrated in two habitats that make up less than 3% of earth’s surface: Marine islands, which make up <2% of earth’s surface and where 61% of known extinctions have occurred, and 37% of Critically Endangered species are found, and freshwater lakes, rivers, streams and ponds, which make up <1% of earth’s surface, and where 28% of known extinctions have occurred and 29% of all Critically Endangered species are found. So, if you want to prevent extinctions, islands and freshwater systems are where you should focus. Next, let’s ask, what’s causing extinctions in these two habitats? There are four main drivers of extinction (what Jared Diamond termed the four ecological horsemen of the apocalypse): habitat conversion, over-exploitation, pollution, and invasive species. Invasive species are the leading driver of extinction on islands and the second leading driver in freshwater systems. So, if you want to prevent extinctions, eradicating invasive species from islands and freshwater systems is a logical approach. And you wouldn’t be the first. Island Conservation has mastered the removal of damaging invasive species from islands and is taking it to scale globally.A recent series of papers made possible by IC’s Threatened Island Biodiversity Database is making critically important contributions to conservation. The Threatened Island Biodiversity Database, developed by Island Conservation and partners, provides a visual, global representation of island species threatened by invasive species. Two global analyses by Holly Jones and colleagues and Erin McCreless and colleagues showed that eradications on islands have already protected an estimated 6% of the most threatened mammals, birds and reptiles in all habitats on Earth, and that future eradications can prevent the extinction of as much as 75% of the most threatened island animals. These global analyses help drive large-scale conservation policy around the world. A new paper by Tershy and colleagues focuses on the world’s threatened island iguana species, which are found in the Caribbean and Fiji. The researchers showed that invasive animals are a primary threat to these iguanas and that 75% of 230 islands surveyed had been invaded by at least one damaging animal. On 45 islands, iguana populations had been completely wiped out. This may sound like more of the aforementioned doom and gloom, but the story doesn’t end here. The research revealed opportunities to prevent extinctions of Caribbean and Pacific iguana species through invasive species eradication; a strategy that has already benefited threatened iguanas on four islands. The researchers found that projects on two islands, Mona Island, Puerto Rico, and Yaqaga Island, Fiji, offer exceptional opportunities to prevent iguana extinctions. This is why Island Conservation has prioritized a collaboration with government and community partners in Puerto Rico to devise a plan to protect iguanas living on Mona Island. Anywhere we find problems in the natural environment, we may also discover opportunities to take action. News of the current extinction crisis is a persistent voice that reminds us: now is the time to conserve. Thanks to efforts like island restoration projects, there is hope yet for threatened species around the world. You can learn more about Bernie Tershy’s work here. Bernie Tershy is an Adjunct Professor in Ecology and Evolutionary Biology at the University of California, Santa Cruz. With Don Croll he co-founded Island Conservation and Conservacion de Islas, science-based NGOs that have protected over 250 seabird colonies and 250 insular endemics from extinction, and formed over 900,000 ha of new marine and island protected areas. As a child, Bernie converted his closet into a terrarium in an unsuccessful attempt to breed Iguana iguana.